The Department of Agriculture is allotting an initial P67 million to bankroll several agricultural and fishery infrastructure projects in Siargao Island, Surigao del Norte, to transform it into a sufficient producer of rice, white corn, other staple crops, vegetables, and aquamarine products. Agriculture Secretary Proceso J. Alcala said the Aquino administration through the Department of Agriculture (DA) will continue to provide needed support and assistance to empower farming and fishing communities in Siargao, and enable small farmers and fisherfolk increase their productivity, earn decent incomes, and subsequently uplift their standard of living. He said the DA will initially help Siargao produce 100 percent of its rice requirements in two to three years’ time, during a July 12 forum at General Luna town, attended by more than 1,000 farmers, fisherfolk and local government officials. To date, the island produces more than one-third or 37 percent of its rice requirements. 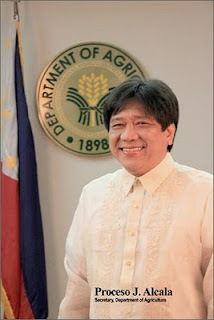 To achieve the rice sufficiency target, Secretary Alcala said the DA through the National Irrigation Administration (NIA) will fund this year the construction and rehabilitation of irrigation systems, amounting to P30 million. To complement it, the DA through the national rice program will also construct a P2-million community seed bank in Del Carmen town, provide P1.5-million worth of various farm machinery and equipment and farm inputs, particularly registered rice seeds for propagation into certified seeds, and put up an organic fertilizer or vermin-composting facility, worth P540,000. During the farmers’ and fisherfolk’s forum in General Luna, the DA chief also committed to validate prospective areas where small water impounding systems (SWIPs) or mini-dams could be constructed by the NIA or the Bureau of Soils and Water Management (BSWM). He said the DA will also undertake five farm-to-market roads (FMR) projects in three towns (San Isidro, Del Carmen, and Dapa), worth P20 million, and establish a 50-hectare coconut seed nursery in Del Carmen, worth P9 million, through the Philippine Coconut Authority (PCA). For fisheries, the DA through the Bureau of Fisheries and Aquatic Resources (BFAR) has provided fisherfolk groups with one motorized banca, ten units of 16-HP boat engines, and 20 gill nets, totaling P1M. The DA-BFAR will also identify other potential marine sanctuaries, explore expansion areas for seaweed production, and conduct training for fisherfolk-leaders and barangay officials and deputize them as “fish wardens” who will apprehend illegal fishermen and poachers. Siargao has a 5,000-hectare mangrove area, considered as the largest in the country. Hence, it is a rich fishing ground and a major source of tuna, shrimps, lobsters, crabs, lobsters, and seaweeds, among other fish and marine species. The DA through the Mindanao Rural Development Program also provided P2-million worth of infrastructure and livelihood projects for the town of Socorro. A P1.5-M farmers’ trading center will also rise up in the town of Del Carmen. The DA chief also committed to establish a mini corn mill and warehouse each in three towns (Pilar, Del Carmen and Socorro) to enhance the production and consumption of white corn grits (or bigas-mais) as main staple.